Just the cover of Sharkopedia is in danger of creeping me out. Heh. Not really but I'm not going swimming in open waters anytime soon either! 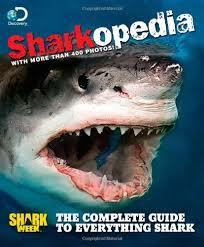 The book explains a great deal about sharks including their anatomy, the orders (There are eight. Who knew? ), a bit about their habits and activities. Sharkopedia discusses a wide variety of sharks and there are tidbits ("fin facts") and information on each page discussing things like the bullsharks' poor eyesight (which causes them to attack anything and everything), sharks which migrate, and lots of encouragement to pass laws to protect these beautiful (and terrifying) creatures. (Please don't misinterpret me here. I think we have a duty and a responsibility to take care of animals. But I have limits on the numbers of laws I think are required to live my life and if a shark were biting my leg off and I had a chance to kill it so that it would stop biting my leg off, I would, law or no.) I should note that there is also a section of this book dedicated to "survivor stories", showing pictures of people's healed limbs (or missing limbs, as the case may be). I'm being seriously tongue-in-cheek with this review and I'm only slightly of sorry about that. I'm seriously amused by the fact that the purpose of this book is to make me think kindly of sharks while showing images which would rightly scare anyone spitless. One thing I can agree with this book on is that sharks are incredible creatures. They are curious beasts who are interesting to observe and learn about. They are awesome in the sense that they inspire awe and ought to be approached with great presence of mind and a load of respect for their abilities. I don't love them and this book didn't change that, but I did enjoy reading more about them. My oldest son (age 6 1/2) is sensitive to what might be perceived as "scary" images. For the most part, he liked flipping through this book but there are some pages and images which he found disturbing and so he ended up asking me to take it away from his presence. I have done so. But that does not make me feel as if I cannot recommend this book. If you are curious about sharks at all, then this book has the ability to satisfy a great deal of your curiosity. It is nicely laid out with a great number of colored photographs set into nicely designed page layouts. There are roughly 180 pages of SHARKS and as that floats a good many boats out there, I'm happy to recommend this one to you for your consideration. Note: my only true objection to this book is in the fact that the information is presented from an evolutionary viewpoint. As a creationist, I dismissed the introduction in which it discusses the theory that sharks have been "swimming in the world's oceans since before dinosaurs roamed the earth." However, Introductory page aside, the majority of the book focuses on actual facts of any variety of shark so I'm not too disturbed. Many thanks to Time Home Entertainment for sending a copy of this title my direction in exchange for my sharing my honest thoughts. I'm not sure why sharks as so popular these days. They can be interesting - but I don't think any amount of information and understanding is going to make them any less scary! But this sounds like a good book for those who want to know more about them. And whereas a 6.5 year old may not want to see some of the images...a 9.5 year old might like that scariness found in the book. It's interesting...sometimes sharks aren't portrayed as vicious and other times they are. We love sharks now that we know more about them. We have watched quite a few documentaries on Nat Geo Wild, Particularly the people who are a part of the Shark Attack Experiment. Like most of Gods creatures they are misunderstood. If you photo shop all the shark teeth out of their pictures they look like big gummy grinning sillies!